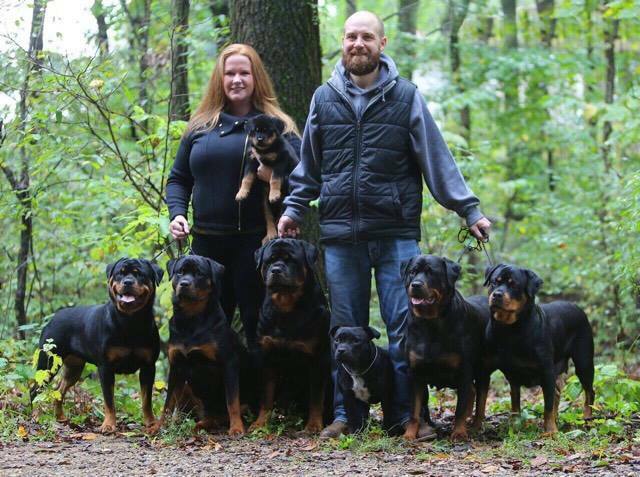 Brzustowicz Rottweilers is nestled amongst 10 acres of tall Oaks and Pines, just west of Kalamazoo Michigan. It all began with my parents some 40 years ago, they started training and showing Golden Retrievers in 3 areas. Conformation, obedience and field, multi titling many of their dogs. Now Years later the torch has been passed to a new generation where the love of Rottweilers has started. The transition from my family’s long history in Golden’s to now Rottweilers started for me when I was in my teens traveling the country with professional handlers, who’s focus was mainly Rottweilers. One show and I was hooked. Now many years later my weekends are spent traveling the country promoting and showing my own dogs in AKC and UKC events. All of the dogs in our breeding program are of the highest quality, balanced, and meet and exceed the breed standard. Each have health clearances and the true Rottweiler temperament. I settle for nothing but the best, our breeding program proves it! We sell puppies into both show prospect homes as well as companion homes. Since we are a professional breeder, we typically only have 1-2 litters per year. We always believe in quality over quantity!